When your wife bursts into tears – unhappy tears – as you’re celebrating your third wedding anniversary, it typically means your marriage isn’t going well. After that, plus another two years of resentment and lack of communication, David Finch is surprised when his wife lovingly wraps her arms around him, and suggests he come down and join her in her office in the basement when he is finished with his evening routine. Once down there, she begins to give him a quiz, a quiz which seems to describe him perfectly. It isn’t until she is finished that she reveals that this quiz is an online diagnostic for Asperger Syndrome, which David fairly conclusively seems to have. Instead of being a blow, however, this news seems inspiring to David: it isn’t that he’s just a bad husband and father, his brain functions a different way than the brains of most of the people around him, which hinders his understanding of those people. Although David can’t simply take a pill for his Asperger Syndrome to mitigate it, as he can for his ADD, but he can begin to change his habits, based on an understanding of how his brain chemistry differs from that of the people around him. It is from this, and his quest to finally become a better husband and father that the Journal of Best Practices is born. The Journal of Best Practices is a fascinating book, not least because of how honest and self-deprecating Finch is. He is remarkably open about his own foibles and shortcomings. The steps he takes to overcome them are often humorous and always interesting. This is not a traditional, chronological memoir, but an anecdote-based series of experiences and attempts to overcome obstacles. Really, Finch’s method of self-improvement for the good of his relationships is one that could be successful for anyone, whether you have Asperger Sydrome or not. 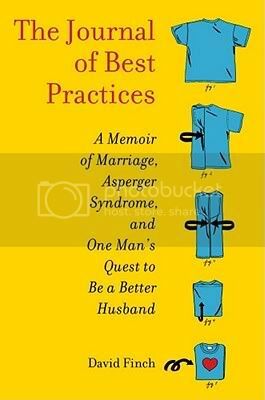 His desire to be the person his family needs him to be is inspiring, and his story has wide appeal, whether you are interested in marriage, Asperger Syndrome, or whether you just wish your husband would would help get the kids ready in the morning once in awhile. Source: Publisher, at the GLIBA trade show. My nephew has Asperger’s and he and his dad are struggling…their family has split up; the 2 sisters live with their mother and my nephew lives with his dad. We try to read everything we can get our hands on…this sounds very interesting…thanks for the recommendation! My sons best friend has Asperger and I try to read as much as I can about it. As they get older (we’re very close to his friend) wonder what’s in store for him. This sounds like a very interesting read. This sounds rather interesting. I don’t think I know anyone with Asperger’s, but it sound worth reading regardless. This sounds like a fascinating book. I’m glad I read your review – otherwise I might have missed hearing about this one. Loved the book as well. And you nailed it – much of the advice in the book could improve any marriage. This is the first I’ve heard of this book and I think it sounds amazing! It’s very intereting how he discovered he had Asperger’s. It also sounds like he has a remarkable marriage but Finch sounds like a remarjable man. It’s so inspiring that he goes to such lengths to change his behavior. I really enjoyed your review, Jen. Thank you! I’m looking forward to this book too. He’ll be discussing and signing it in my store on Saturday, Jan 14, should be interesting! I read this book with some interest, as the parent of a child with Asperger and as a family therapist. First, many of the behaviors he describes as most problematic are not Asperger-related but have much more in common with obsessive-compulsive disorder. A lot of what this book amounts to is cognitive-behavioral therapy for OCD. Second, as a therapist, while I would applaud his approach to making his marriage better, I am concerned that there is an imbalance of power in this marriage. His wife seems to be able to make a list of the little things she would prefer he do, and he does it. Fantastic. But I do not read about a lot of “give” on her end. At some point that’s not gonna work.